Andris Nelsons conducts the Boston Symphony Orchestra, the Tanglewood Festival Chorus, and soloists (standing, from left) Rachel Willis-Sorensen, Violeta Urmana, Dmytro Popov, and Matthew Rose at Symphony Hall Thursday. It’s hard to think of a major work by a major composer that’s as uncelebrated as Antonín Dvorák’s “Stabat Mater.” Begun in 1876 and completed the following year, this sacred cantata takes its text from the 13th-century Latin poem that depicts Mary, the mother of Jesus, standing at the foot of the cross and lamenting her son’s death. (“Stabat Mater dolorosa,” the first line, means “The grieving mother was standing.”) The poem has been set by a who’s who of composers, ranging from Palestrina and Haydn to Rossini, Liszt, Poulenc, and Pärt, but at close to 90 minutes, Dvorák’s treatment is by far the most expansive. 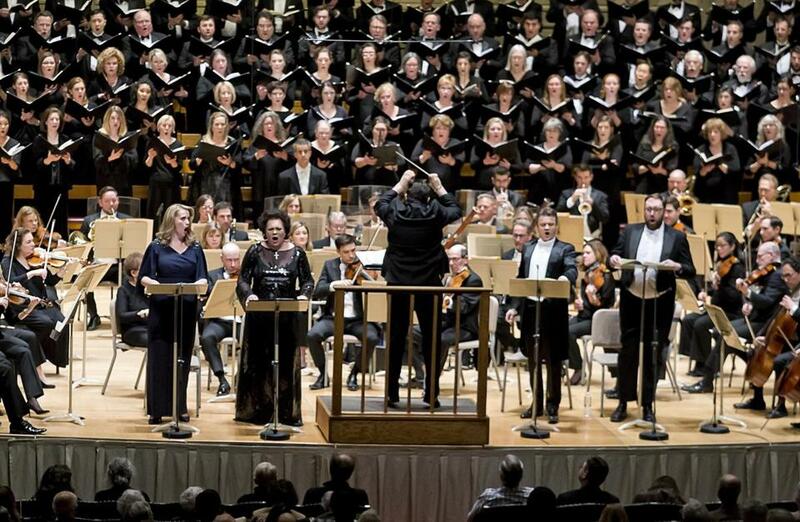 Thursday at Symphony Hall, Andris Nelsons and the Boston Symphony Orchestra conveyed its many moods, from reverence to anguish to ecstasy. Dvorák’s “Stabat Mater” was a response to the recent deaths of his first three children; he may also have been stimulated by the atmosphere at St. Adalbert’s in Prague, where he was church organist at the time. He apportioned the text of the poem — 20 stanzas of three lines each — into 10 parts. In the first two of these, the vocalists describe Mary’s grief. Thereafter, starting with stanza nine, they address Mary directly, asking to join in her weeping, to share Christ’s Passion, to be defended by her, and to be granted the glory of Paradise. The work premiered in Prague in 1880 and was a huge success. It was even huger when the composer himself led it at London’s Royal Albert Hall, in 1884: he had a chorus of 840 and an orchestra that included 92 strings. The BSO gave its first performance of “Stabat Mater” in 1891, in Louisville, Ky.; since then the orchestra has presented the complete work just once, under Seiji Ozawa, in 1981. Nelsons’s reading was anything but gray. He balanced the four soloists and the 106 voices of the Tanglewood Festival Chorus against a pared-down orchestra with just 46 strings, and there was no drag in the 82-minute running time. He built drama from the opening sequence of F-sharps and descending lines that suggest the descent from the cross. He conveyed the waltzy sections of Part I, the limping-funeral-march rhythm of Part II (with its English-horn cameo), the lilting (and in this case quick) Siciliana of Part V, the choral triumph of Part VI, the steady tread of Part IX, the exultant D-major conclusion. If there didn’t always seem as much tempo variation as Dvorák calls for, there was always ample dynamic contrast.